Holly was born prematurely at 24 weeks, weighing just 1lbs 6oz. Due to her small size, she was born with Retinopathy of Prematurity (ROP). 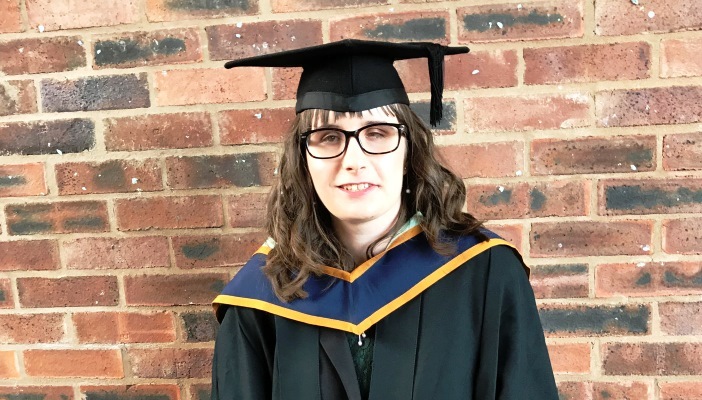 Now as an adult, Holly has created the blog, LifeofaBlindGirl.com as a way of sharing her experiences of living with a visual impairment in a predominantly sighted world. Holly spoke to NB Online about what it’s like to have ROP. If a baby is born too early, their retinal blood vessels do not develop completely which can cause problems and can lead to Retinopathy of Prematurity. Abnormal blood vessels may grow out of the retina and leak, causing scar tissue to form, leading to detachment of the retina. This damage is known as retinal detachment and if not monitored or not treated at the correct time, can cause vision loss. How does ROP affect your sight? There are five stages of ROP and I have the most severe as the retina was totally detached in my left eye. I have no useful vision in that eye, and I only have light perception in my right eye. As a baby, I had surgery to try to stop my retina from detaching but it was unsuccessful. Since then, I have recently been diagnosed with Phthisis bulbi, or ‘end-stage eye’, due to scarring from operations I have since had. I’ve also developed chronic inflammation in that eye (Uveitis). How long did it take to get a diagnosis? It was highly likely that I would have vision problems as I was born so early. I needed more oxygen than full-term babies and this increased my chances of developing ROP. The diagnosis was therefore found rather quickly and I had various eye examinations to determine the severity of the condition. Have you had treatment for your conditions? Many babies with ROP don't need treatment as often it resolves on its own, but this wasn't an option for me. Other than the unsuccessful surgery I had when I was younger, I have recently had two operations to help reduce the chronic inflammation in my left eye. Was it difficult to find out information about your conditions? At the time, my parents weren’t given much information on my condition. As I got older, I started to connect with other blind and visually impaired people who had the same condition. I also started my blog (Lifeofablindgirl.com) so I could share my experiences of living with ROP. How do your conditions affect you day-to-day? I use a long cane to get around which is key to my independence. I absolutely hated using it at first but have grown to love it and see it as an extension of me. I started learning braille when I was four or five, learnt to touch type when I was around seven and can also read various forms of braille including music braille, German braille and French Braille. I attended mainstream education then went on to graduate university, and I am now in employment. What technology do you find most helpful at work and at home? Technology plays such an important part in my life. It has given me the ability to study and work, and to run my blog. I mainly use Apple products as they have built-in accessibility features and I have a screen-reader on the computer, smartphone and iPad. I use a variety of different apps for reading/listening to audio books and music, planning my travel arrangements, and identifying products. I also use a braille display and an OrCam which reads printed text out loud. What would you like eye health and sight loss professionals to know about your condition? As ROP affects people in different ways, each person’s case is unique. I think it’s really important for professionals to adapt your care on a case-case basis, rather than grouping everyone with the same condition together in one category. The spectrum of sight is varied so what one person may be able to see, someone else might not. Do people get it wrong when they ask you about your eye conditions? I have been asked many strange questions about my visual impairments. I have had people ask, “Can’t they just reattach your retina?” If this was the case, I would certainly have had that done by now. I’m all for people asking questions, but sometimes they are weird or stupid. It’s very important to educate society on sight loss and the spectrum of sight. If you’d like to find out more about living with ROP, check out Holly's blog, LifeofaBlindGirl.com.